This update includes some nice new features - for example, creating columns by example and changing chart axis titles. Read this blog for a full list! Choose this menu on the HOME tab in Query Editor. 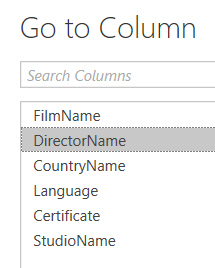 You can double-click on the column you want to go to. 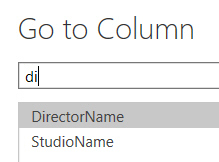 This facility works really quickly (here we're showing all columns whose titles contain the letters di). And that's the end of this look at tthe non-preview features in this update!